Introduction. 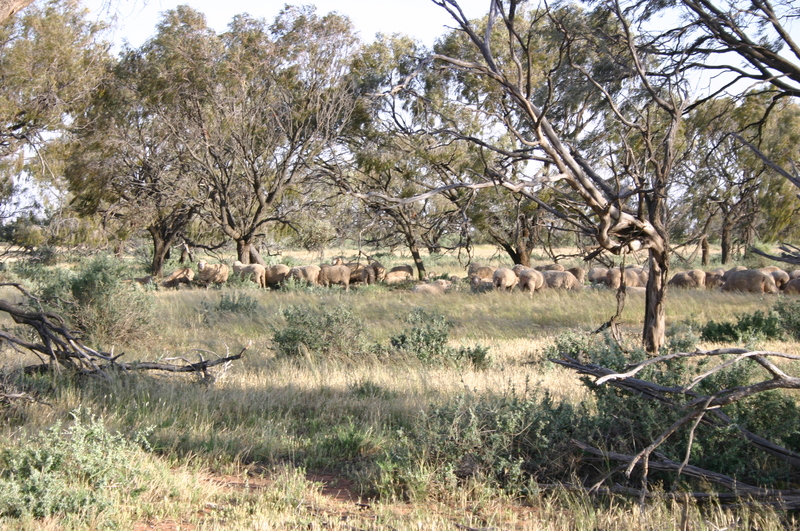 Barrabool is a 5000 ha dryland all-Merino sheep property between Conargo and Carrathool in the Western Riverina, NSW. Native pastures are the mainstay of Barrabool, as they are of other grazing properties in the arid and semi-arid rangelands of New South Wales that generally lie to the west of the 500 mm average rainfall limit. Indigenous ecosystems at Barrabool occur as native grassland, mixed acacia and callitris woodlands and shrublands. The main grass species in the grasslands are Curly Windmill (Enteropogon sp. ), White Top (Rytidosperma sp. ), Box Grass (Paspalidium sp. ), Speargrass (Austrostipa spp. ), and Windmill Grass (Chloris sp.). Broad-leaved species include Thorny Saltbush (Rhagodia sp. ), Cotton Bush (Maireana sp.) and a diverse annual forb layer in Spring.. The majority of the property has belonged to the Driver family for over 100 years. Like many of the surrounding stations a gradual but noticeable increase in exotic species occurred during the mid-to-late 20th Century, and a decline in native species. This transition has occurred because of species being transferred by livestock movements and because sheep graze not only on grass, but also saltbush shrubs and sub-shrubs as well as seedlings of native trees such as Boree (Acacia pendula) and White Cypress Pine (Callitris glaucophylla). It is well known, for example, that the preferential and continuous grazing of Boree by sheep can turn a Boree woodland into a grassland .within a manager’s lifetime unless rest and regeneration are allowed. In recent decades – because of the Driver family’s interest in conservation and our exposure to advances in grazing management, paddock subdivision and stock water relocation – we have developed in recent decades a managed grazing system based on feed availability, regeneration capability and seasonal response to rainfall. It was our hope that this system could improve the condition of native vegetation while also improving feed availability. Figure 1. 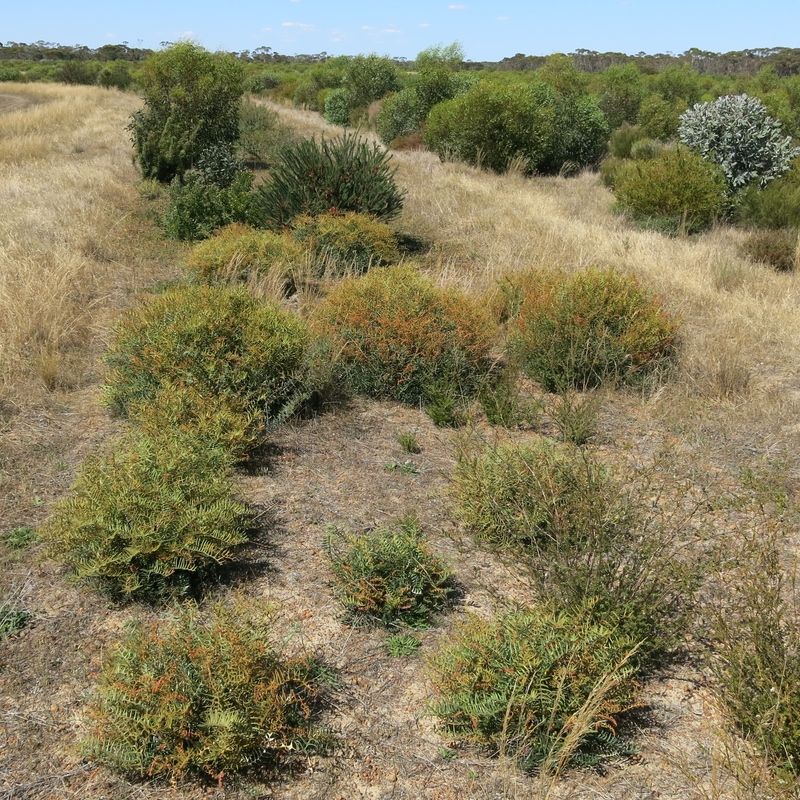 Boree (Acacia pendula) and Thorny Saltbush (Rhagodia spinescens) in grazed paddocks at the Driver’s 5000 ha sheep property, Barabool, in the western Riverina. (Photo M. Driver). Works undertaken. Over the last 35 years we have progressively fenced the property so that it is subdivided by soil type and grazing sensitivity, with watering systems reticulated through poly pipe to all those paddocks. This enables us to control grazing to take advantage of where the best feed is and move stock from areas that we are trying to regenerate at any one time; and it gives us a great deal more control than we would have had previously. Using our grazing system, we can exclude grazing from areas that are responding with regeneration on, say Boree country, for periods of time until Boree are less susceptible to grazing; at which time we bring stock back in. We take a similar approach to the saltbush and grasses, moving sheep in when grazing is suitable and moving them off a paddock to allow the necessary rest periods for regeneration. In this way we operate a type of adaptive grazing management. We also have areas of complete domestic grazing exclusion of very diverse and sensitive vegetation which are essentially now conservation areas. Results. The native vegetation at Barrabool has noticeably improved in quality terms of biodiversity conservation and production outcomes over the last 35 years, although droughts have occurred, and in fact been more frequent during this time. In terms of conservation goals Boree regeneration and Thorny Saltbush understory restoration has been both the most extensive and effective strategy. Areas of mixed White Cypress Pine woodland have proven to be the most species diverse but also offer the greatest challenges in exotic weed invasion and management. The Pines themselves are also the most reluctant to regenerate and suffer many threats in reaching maturity while many of the secondary tree species are both more opportunistic and show greater resilience to drought and other environmental pressures. The increase in perenniality of grass and shrub components of the property have been significant, with subsequent increase in autumn feed and reduced dependence on external feed supplies. In terms of production outcomes, after the millennium drought the property experienced three seasons in a row in which there was much less rainfall than the long term average rainfall. At the beginning of that period we had the equivalent of more than the annual rainfall in one night’s fall and then went for 12 months from shearing to shearing with no rain recorded at all. Yet the livestock and the country, however, did very well compared to other properties in the district, which we consider was due to the stronger native vegetation and its ability of the native vegetation to withstand long periods without rain. Lessons learned and future directions. While many other sheep properties in the wider area are more intent on set stockingin their grazing practices, the results at Barrabool have demonstrated to many people who have visited the property what is possible. I am sure we are also are having some effect on the management systems of other properties in the district especially in the area of conservation areas excluded from grazing. What we plan for the future is to explore funding options to fence out or split ephemeral creeks and wetlands and encourage Inland River Red Gum and Nitre Goosefoot regeneration.Our long term goal is to maintain the full range of management zones (including restoration zones earmarked for conservation, rehabilitation zones in which we seek to improve and maintain biodiversity values in a grazing context, and fully converted zones around infrastructure where we reduce impacts on the other zones. Introduction. The Peniup Restoration Project was initiated in 2007, when Greening Australia and Bush Heritage Australia jointly purchased a 2,406 hectare property as a contribution to the conservation and restoration objectives of Gondwana Link. The property has an average annual rainfall of approximately 450mm per year and had previously been farmed in a traditional broad acre sheep and cropping rotation system. 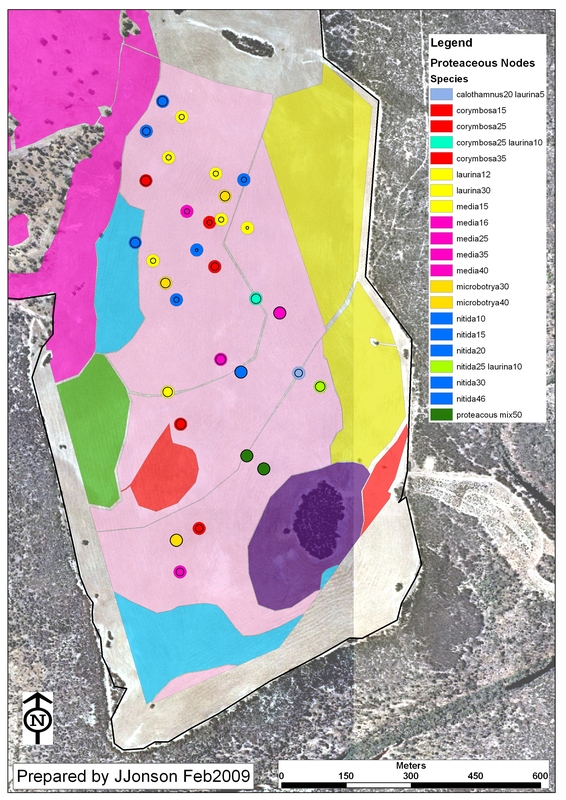 The site is located within a highly diverse mosaic of varying soils and associated vegetation associations across Mallee, Mallee Shrubland, and Woodland type plant communities. Planning and 2008 Operational Implementation. In 2008, Greening Australia’s Restoration Manager Justin Jonson developed a detailed ecological restoration plan for 950 hectares of cleared land on the northern section of the property. 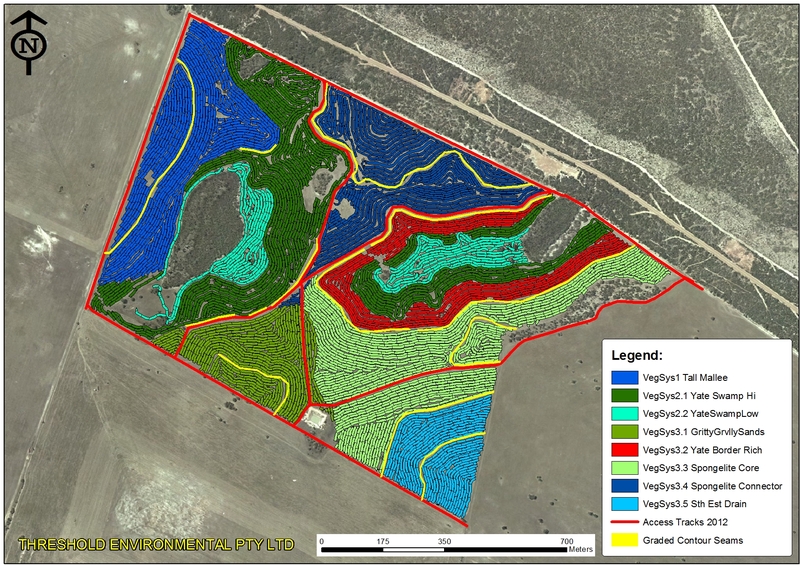 Information and procedures applied for that work are detailed in the EMR Journal article Ecological restoration of cleared agricultural land in Gondwana Link: lifting the bar at ‘Peniup’ (Jonson 2010). Further information is also available for the specific vegetation associations established via the Peniup Restoration Plan, with species lists according to height stratum, including seedlings planted by hand which were nitrogen fixing or from the Proteaceous genera. Funding for the initial 250 hectares of restoration were raised and the project implemented in 2008 (Fig.1). Figure 1. The 2008 operational areas at Peniup showing communities replanted by direct seeding, and GPS locations of permanent monitoring plots (n=42), patches of hand planted seedlings (n=31) and seed (n=61), pre-planning soil sampling sites (n=115) and contour oriented tree belts to ensure establishment across the site. Monitoring. A total of 42 monitoring plots were laid out across seven of the nine plant communities established (Fig.2). Details of the methodology, results and ongoing evaluation have been published (Jonson 2010; Hallet et al. 2014; Perring et al. 2015). Results to date. 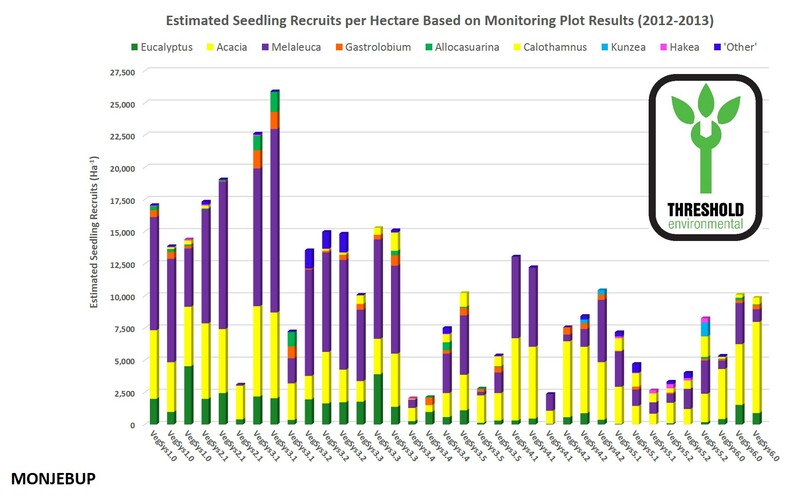 Monitoring indicates approximately 3.8 million plants were re-established by the direct seeding across the 250 hectare project area. The numbers established in each plant community are shown in Fig.3 and represent the majority of plant species in each reference model. After 8 years it is clear that the project’s objectives are on track to being achieved, considering: a) absence of agricultural weeds; b) nutrient cycling through build up and decomposition of litter and other detritus; seed-rain by short-lived nitrogen-fixing Acacia shrubs, c) diverse structural development of re-establishing species; and, d) presence of many target animals using the site. 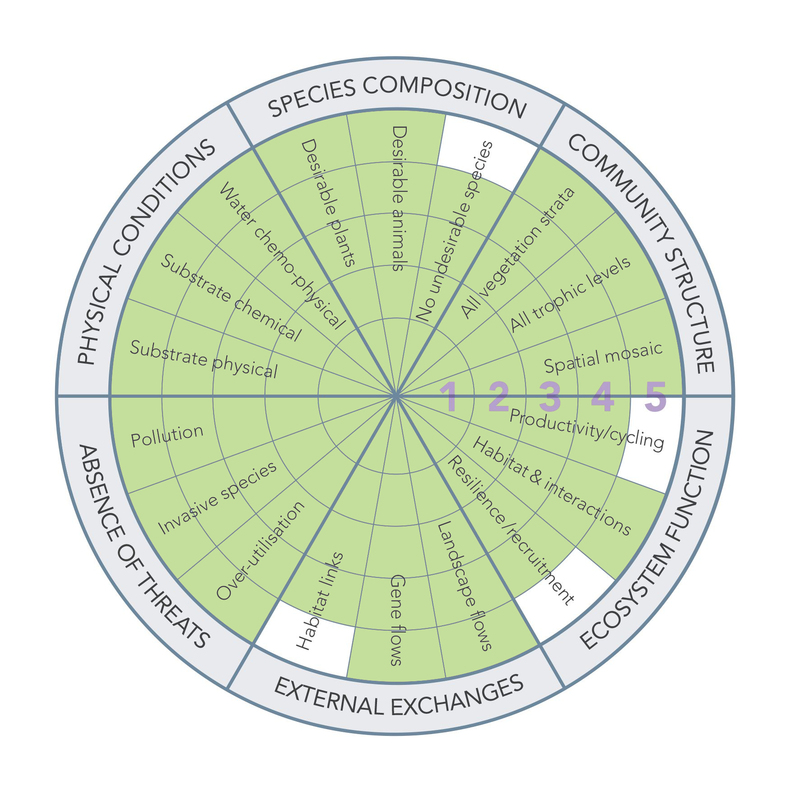 Peniup’s progress in terms of recovery of the National Restoration Standards’s 6 ecosystem attributes is depicted and tablulated in Appendix 1. Figure 3. 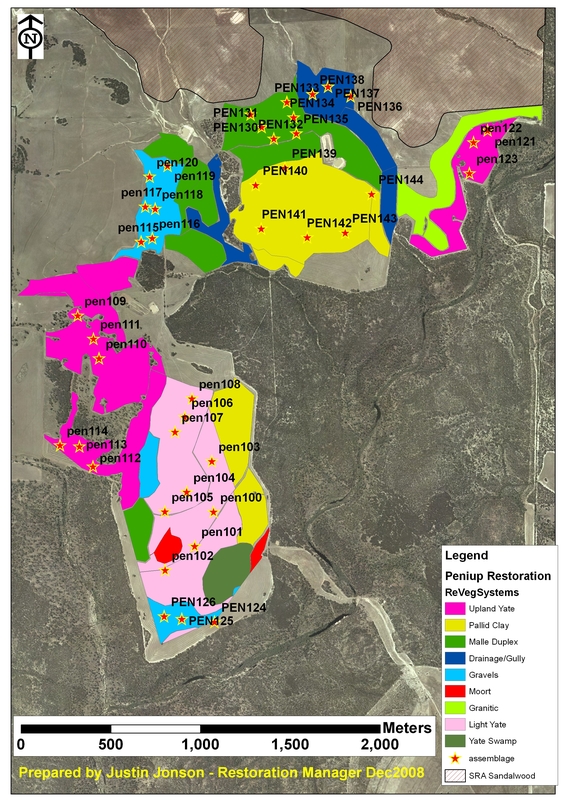 Per hectare estimates of Peniup plant establishment counts by restoration plant community. Figure 4. 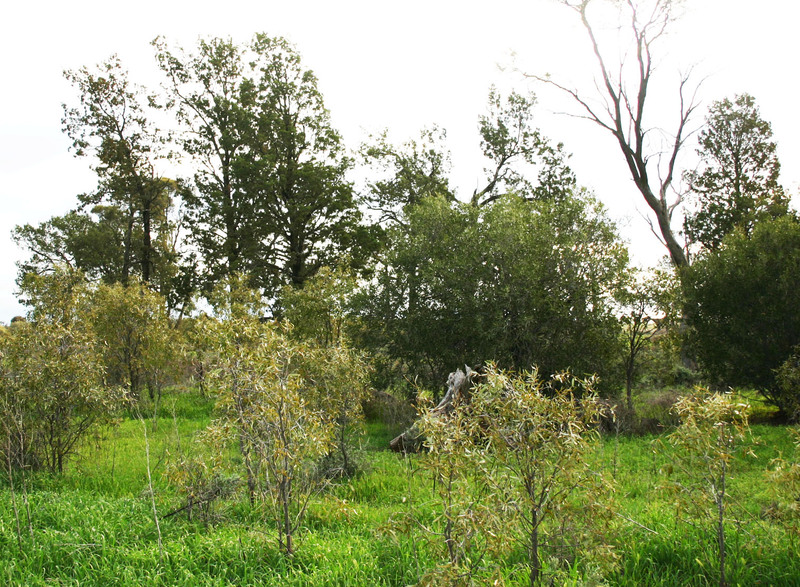 Riparian/drainage Tall Yate open woodland community at Peniup – with mid and understory shrubs and mid-story trees. Innovation. As an adaptive management approach, small, discrete patches of seedlings of the proteaceous family were hand planted to make best use of small quantities of seed. Planting of these 5,800 seedlings in small patches, termed ‘Nodes’, provided further resource heterogeneity within relatively uniform seed mixes (by soil type). The impetus for this approach was to create concentrated food sources for nectarivorous fauna, while increasing pollination and long-term plant species viability (Jonson 2010). Figure 5. Distribution of Proteaceous Nodes. Lessons learned. Continuity of operational management is a critical component to achieving best practice ecological restoration. Project managers must be involved to some degree in all aspects of works, because flow on consequences of decisions can have high impact on outcomes. Detailed planning is also needed with large scale projects; otherwise the likelihood of capturing a large percent of site specific information is low. Finally, the use of GIS software for information management and site design is an absolute necessity. Figure 6. Banksia media and Hakea corymbosa plants with seed set after 5 years. Figure 7. 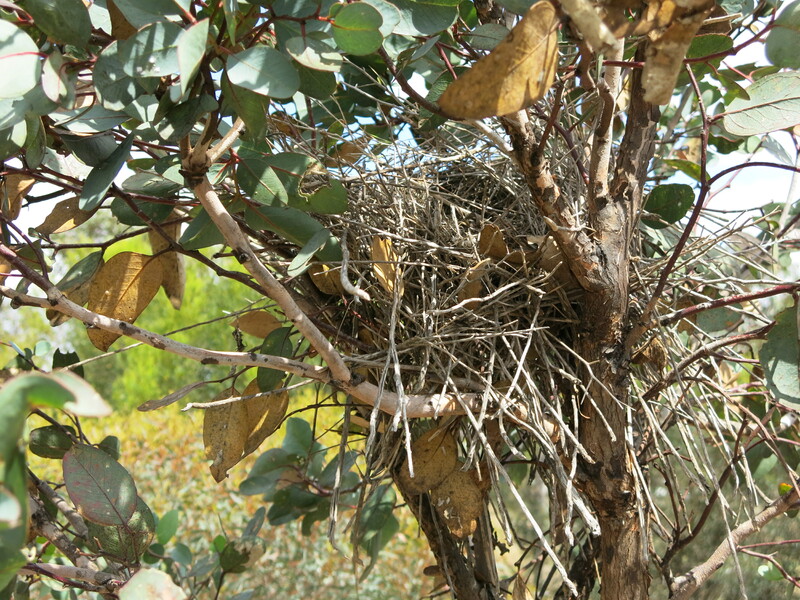 Bird nest within 5-year old Yate tree at Peniup. Figure 8. Five-year-old vegetation is contributing to a visible build up of organic matter and decomposition is indicating cycling of nutrients. Stakeholders and Funding bodies. Funding for this Greening Australia restoration project was provided by The Nature Conservancy, a carbon offset investment by Mirrabella light bulb company, and other government and private contributions. Introduction. Bush Heritage Australia’s (BHA) Monjebup North Reserve is a property that directly contributes to the conservation, restoration and connectivity objectives of Gondwana Link – one of Australia’s leading landscape scale restoration initiatives. Building on a solid history of revegetation projects implemented by collaborators from Greening Australia and individual practioners, the BHA management team initiated and funded a $40K Ecological Restoration Planning Project for 400 hectares of marginal farmland in need of restoration. The specific aim of the Monjebup North Ecological Restoration Project was to 1) plan and 2) implement a ‘five star’ ecological restoration project as defined by the Gondwana Link Restoration Standards. Overarching goals included the re-establishment of vegetation assemblages consistent with the surrounding mosaic of plant communities, with a specific focus on local fauna and the restoration of habitat conditions to support their populations. Figure 1: Map showing GPS locations of soil auger sampling locations. Planning and identification of reference communities for restoration of cleared land. The Monjebup North Ecological Restoration Project began with a third party consultancy contract to develop the Monjebup North Ecological Restoration Plan. 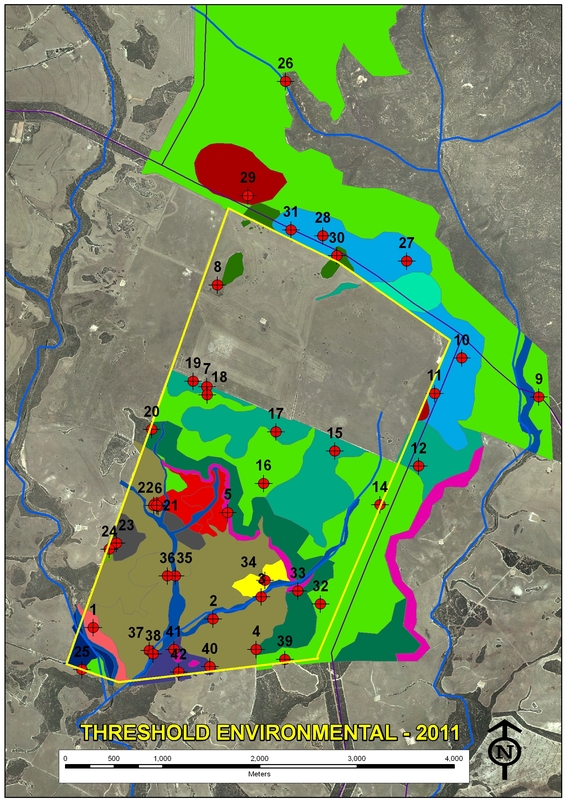 This work began with the collection of detailed field data, including 120 soil survey pits collected to define the extent and boundaries between different soil-landform units occurring on the site (Fig.1). 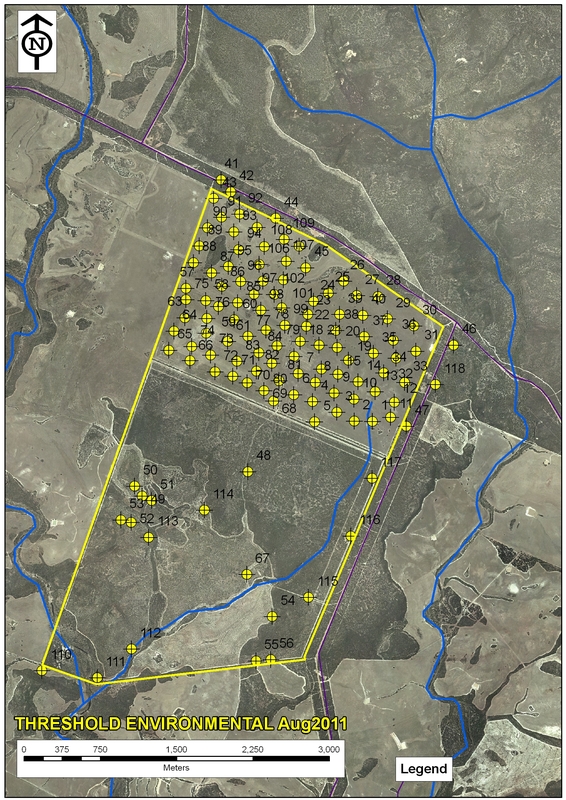 In the absence of previously defined and/or published information on local plant communities, an additional vegetation survey and report, The Vegetation of Monjebup North, was developed, which included 36 vegetation survey sites widely distributed across the surrounding vegetation (Fig.2). A total of 10 primary vegetation associations were defined within remnant vegetation on and around the site from this work (Fig.3). Additional soil survey pits were established within these defined plant communities to develop relationships between observed vegetation associations and soil-landform units. Cross referencing this information to the 400 hectare area of cleared land resulted in the delineation of seven core reference communities to guide the restoration project. These restoration communities ranged from Banksia media and Eucalyptus pluricaulis Mallee Scrub associations on spongelitic clay soils, to Eucalyptus occidentalis (Yate) Swamp Woodland associations located in low-lying areas where perched ephemeral swamps exist. Figure 2: Map showing GPS locations of flora survey sampling sites. Figure 3: Output map of dominant vegetation associations at Monjebup North Reserve. Figure 4: Mosaic of plant communities replanted at Monjebup North in 2012 using direct seeding and hand planted seedlings. A tractor fitted with GPS unit enables real time seeding passes, as shown on the map. Figure 5: Mosaic of plant communities replanted at Monjebup North in 2013 using direct seeding and hand planted seedlings. A tractor fitted with GPS unit enables real time seeding passes, as shown on the map. Seed sourcing. Seed from approximately 119 species were collected on and around the site for the restoration works. Seed collections for some species were collected from a number of geographically separate sub-populations, however these were never located further than 10 kilometers from site. Collections were made from at least 20 individuals for each species, and preference was made in collecting from populations which had 200+ individuals. 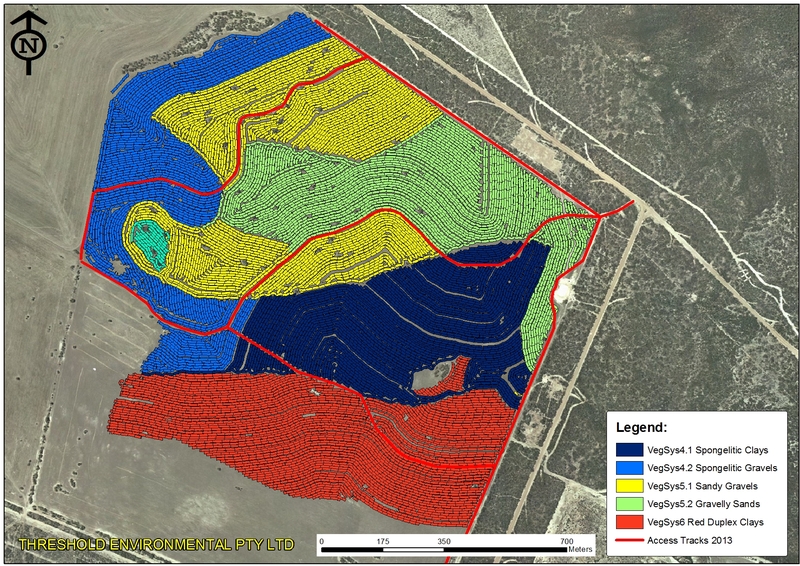 The primary on-ground works were initiated across four years from 2012 to 2015, starting with a 100 ha project area in 2012 (Fig.4), and a 140 ha area in the following year (Fig.5), both by Threshold Environmental Pty Ltd. A combination of direct seeding and hand planted seedlings treatments were employed, where seed mixes were developed to achieve the bulk of plant recruitment across each of the soil-land form units, and nursery grown seedlings were planted by hand for species found to be difficult to establish from direct seeding or for which stocking densities were to be more closely controlled. This work involved 13 communities and 148 species. A number of innovative operational treatments were employed. These included grading 5 kilometers of contour banks and spreading chipped vegetation and seed pods, and 180 in situ burning patches where branch and seed material from fire-responsive serotinous species were piled and burned (Fig.6 before, Fig.7 after). Seedlings for rare, high nectar producing plant species were also planted in 203 discrete ‘node’ configurations. Habitat debris piles made of on-site stone and large branch materials were also constructed at 16 locations across the 2012 project areas. 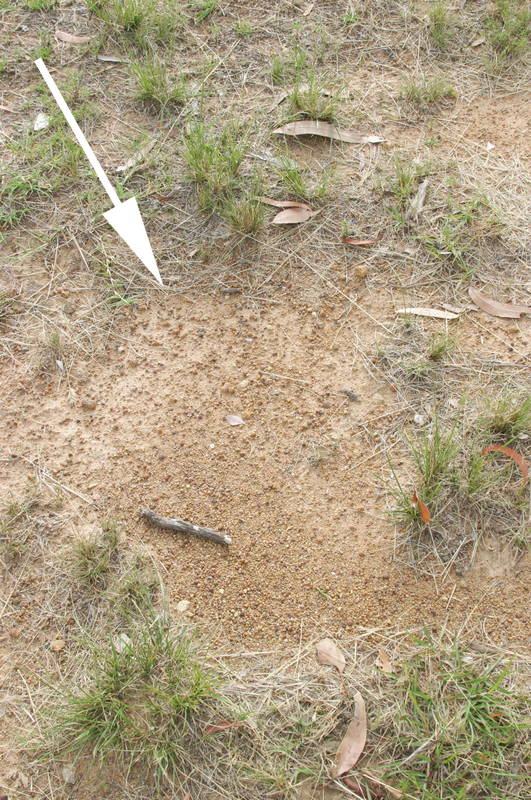 Figure 7: Photo of Dryandra nervosa juvenile plants establishing from one of the in situ burn pile locations. Other species used for this technique included Dryandra cirsioides, Dryandra drummondii, Hakea pandanicarpa, Isopogon buxifolius, and Hakea corymbosa. Monitoring. Monitoring plots were established to evaluate the direct seeded revegetation, as presented in the Project Planting and Monitoring Report 2012-2013. Fauna monitoring has also been undertaken by BHA using pit fall traps, LFA soil records, and bird minute surveys. Results to date. Monitoring collected from post establishment plots in from the 2012 and 2013 areas (2 years after seeding) showed initial establishment of 2.4 million trees and shrubs from the direct seeding (Fig.8 and Fig.9). Results of faunal monitoring are yet to be reported, but monitoring at the site for vegetation and faunal is ongoing. 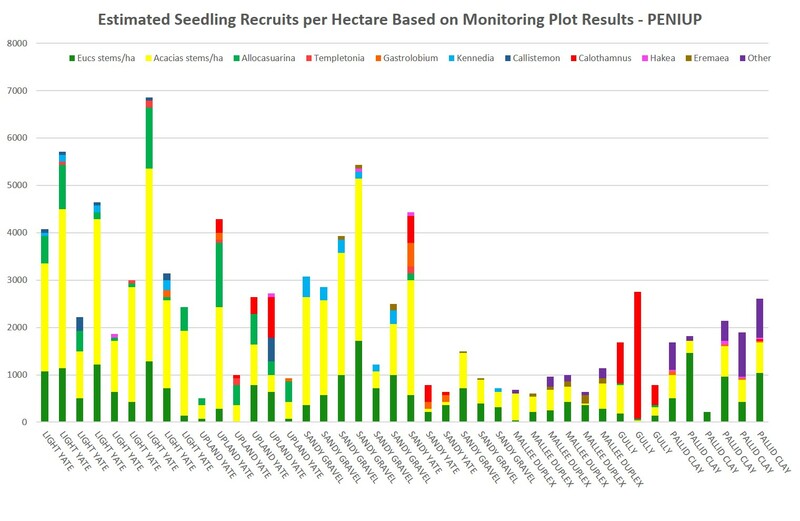 Figure 8: Graphic representation of monitoring results from 2012 and 2013 operational programs showing scaled up plant counts across the plant community systems targeted for reconstruction. 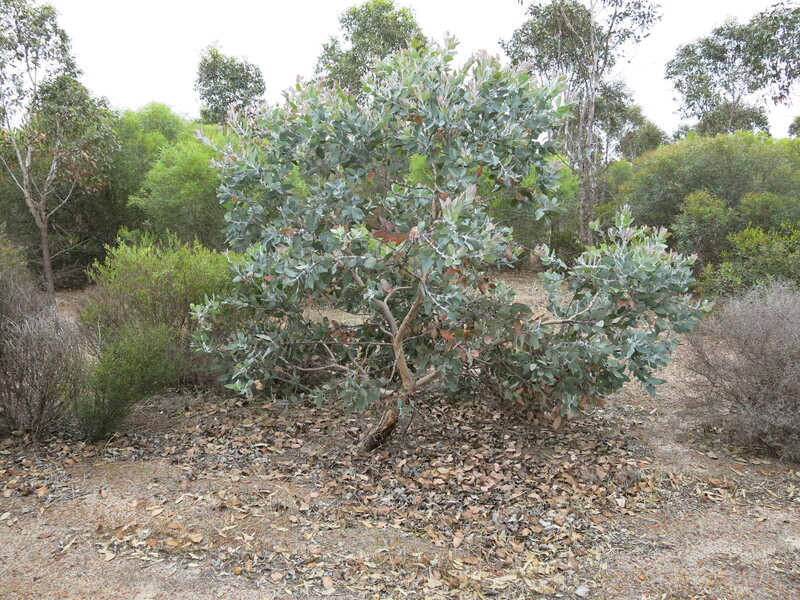 Figure 9: Photo showing 3 year old establishment and growth of a Banksia media/Eucalyptus falcata Mallee shrub plant community with granitic soil influence from the 2012 Monjebup North restoration project. Lessons learned and future directions. The decision to develop a restoration plan in advance of undertaking any on-ground works was a key component contributing to the success of the project to date. Sufficient lead time for contracted restoration practioners to prepare (>12 months) was also a key contributor to the success of the delivery. Direct collaboration with seed collectors with extensive local knowledge also greatly benefited project inputs and outcomes. Stakeholders and Funding bodies. Major funding for the project was provided by Southcoast Natural Resource Management Inc., via the Federal Government’s National Landcare Program and the Biodiversity Fund. Of note is also Bush Heritage Australia’s significant investment in the initial purchase of the property, without which the project would not have been possible. Comments Off on Learning from the Coreen TSRS – and scaling up biodiversity recovery works at hundreds of sites in the Riverina, NSW. Key words. Private conservation area, natural regeneration, ecological restoration, rabbit control. Introduction. Neds Corner Station is Victoria’s largest private conservation property. This 30,000 hectare ex-sheep and cattle station was purchased for nature conservation by Trust for Nature (Victoria) in 2002. The property occupies the driest area of the state with an average annual rainfall of only 250 mm. As such, it has strong ecological links to the arid regions of Australia and Australia’s rangelands. Neds Corner sits strategically at the hub of an extensive network of public and private conservation lands bordering or close to the Murray River in Victoria, New South Wales and South Australia. The reserve is bordered on three sides by the Murray Sunset National Park and borders frontages along the Murray River and associated anabranches for more than thirty kilometres, where the River Red Gum (Eucalyptus camaldulensis) dominated riparian zone connects with Chenopod Shrublands, Semi-arid Chenopod Woodlands and Chenopod Mallee Woodlands. Trust for Nature’s restoration efforts are targeted at restoring woodland connectivity across the property to improve habitat extent and condition for woodland and mallee plants and animals, including the nationally threatened Regent Parrot (Polytelis anthopeplus). A biodiversity survey in 2011 found 884 native species at Neds Corner Station, including 6 threatened birds and animals, 77 threatened plants, and 21 species new to science. Trust for Nature continues to find new records for the property. Fig. 1. Highly degraded area (near watering points) in 2003 just after Trust purchased the property. Fig. 2. Same photopoint in 2014 showing extensive natural regeneration of Low Chenopod Shrubland after removal of livestock and extensive treatment of rabbits. Planning for recovery. In 2002, when Trust for Nature first took on the property, the land was severely degraded from continuous over grazing by stock, rabbits and native herbivores; weed infestations; historic clearing of extensive areas of woodland for firewood and forage; and lack of flooding. Native vegetation was sparse over much of the property, soil erosion was extensive and the floodplain and semi-arid woodlands were all showing signs of extreme stress. In the early years of ownership, management focussed on addressing the most obvious of these threats, with a focus on rabbit control and weed control. In 2010, with funding support from The Nature Conservancy, Trust for Nature prepared a Conservation Action Plan for the reserve, using the Open Standards for Conservation process, and a subsequent management plan. 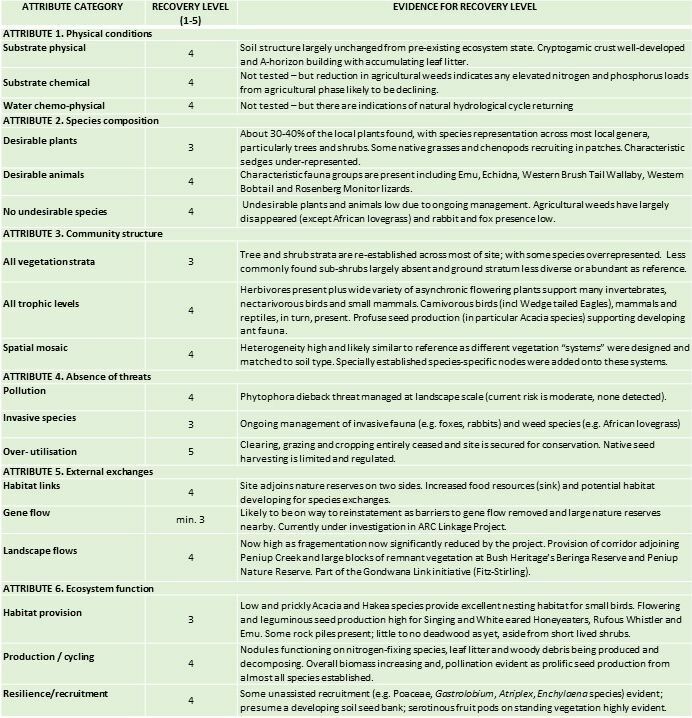 These planning documents identified the key biodiversity values on the reserve, the major threats to these values and the strategies to reduce threats and improve condition to achieve agreed ecological goals. Fig. 3. Dune Wattle (Acacia ligulata) natural regeneration after cropping was discontinued. Fig 4. Hop Bush (Dodonaea viscosa) natural regeneration after cropping ceased. Works undertaken. Trust for Nature’s first action was to remove the livestock to allow the regeneration and growth of native vegetation. Stock fencing was decommissioned to enable free movement of native fauna, and new exclosure fencing to protect sites of cultural and ecological significance were also constructed. Major efforts were made to reduce rabbit numbers through the use of warren ripping, fumigation and 1080 baiting across the property. To date, over 20,000 warrens have been treated. Direct seeding and tubestock planting in the Semi-arid Woodland areas of the property have been continuous, with the cessation of a cropping licence, over 500 ha direct seeded in one year as part of an Australian Government funded project. In partnership with the Mallee Catchment Management Authority, environmental water allocations have been used to inundate areas of Neds Corner, providing a vital lifeline to many of the plants and animals that inhabit the riverine billabongs and floodplain forests. Artificial water points and superfluous tracks have been closed. Targeted fox and other feral animal programs are continuous. Fig 5. Highly degraded ‘Pine paddock’ in 2003 just after the Trust purchased the property. Fig 6. Pine paddock from same photopoint in n2014 after exclosure fencing, rabbit control and extensive direct seeding of trees and shrubs in 2007 (and again in 2010). The grasses all naturally regenerated. Results. In the 14 years since domestic stock removal and the ongoing control of rabbits and weeds, there has been a dramatic increase in the cover of native vegetation, notably from natural regeneration (Figs 1-4) but also from extensive supplementary planting and direct seeding (Figs 5-8). 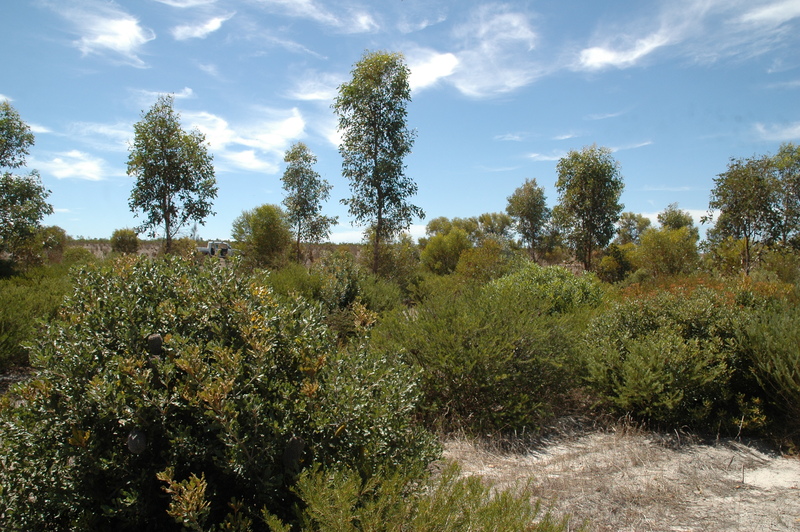 In 2011, wide spread natural germination of Murray Pines occurred across the woodland sections of the property and Sandhill Wattle (Acacia ligulata) seedlings were observed on one rise where no parent plant was known to occur, indicating a viable seed bank may exist. The vulnerable Darling Lilies (Crinum flaccidum) continue to extend their range, given favourable weather conditions and the continuous control of herbaceous threats to the extent required to ensure adequate recruitment of these key flora species. Bird surveys undertaken for one of the targeted projects within Neds Corner over the past 10 years show an encouraging increase in reporting rates of Brown Treecreeper (Climacteris picumnus victoriae) (>x2 increase), Chestnut-crowned Babbler (Pomatostomus ruficeps) (>x2% increase) and Red-capped Robin (Petroica goodenovii) (>x20 increase). Fig 8. Same revegetation planing line in 2013. Current and future directions. Trust for Nature are due to revise their CAP and have identified the need to undertake recovery actions at a greater scale. They are currently investigating the feasibility of re-introducing some fauna species back into Neds Corner Station that haven’t been found in the region for decades, provided there is sufficient habitat to sustain them. Acknowledgements. As a not-for-profit organisation, Trust for Nature (Victoria) relies on the generous support of many individuals, organisations and government entities. The main project partners to date include The Nature Conservancy, RE Ross Trust, Yulgilbar Foundation, Australian Government, Mallee Catchment Management Authority, Parks Victoria, Department of Environment, Land, Water & Planning, Mildura Rural City Council, Northern Mallee Region Landcare, Traditional Owners and the thousands of hours volunteers contribute to Neds Corner Station. Keith Bradby, Eugene Eades, Justin Jonson, Barry Heydenrych. Introduction. Greening Australia’s 754 ha Nowanup property was one of the first purchased with donor funds to help achieve the Gondwana Link programme’s goal of reconnecting native habitats across south-western Australia (Fig 1). The ecological work of Gondwana Link is underpinned by the involvement of people living within the region’s landscapes. Nowanup (Fig 2) is a visually compelling place, with rising breakaway mesas, broad sweeping plains, and views south down the Corackerup valley and south west to the Stirling Range. Its remaining native vegetation systems are dominated by mallee shrublands, mallet and moort woodlands and banksia heathlands. It contains large populations of the locally endemic eucalypts Corackerup Moort (Eucalyptus vesiculosa) and Corackerup Mallet (E. melanophitra) and it is expected that additional rare flora species will be found. It also supports populations of a range of threatened fauna species including Malleefowl (Leipoa ocellata), Western Whipbird (Psophodes nigrogularis), Shy Groundwren (Hylacola cauta whitlocki), Crested Bellbird (Oreoica gutturalis gutturalis) and Black-gloved wallaby (Macropus irma). The original native vegetation remains in the upper section of the property (Fig 3), though much of this area has been cleared and burnt for farming, but never farmed. The farmland areas are now largely replanted. Fig. 2. Nowanup has visually compelling rock features and expansive landscapes. Cultural significance. The groups involved in Gondwana Link support a range of social and cultural activities involving donors, farmers, government agencies, research bodies, industry groups and various landcare and natural resource management groups. Primary among these are the Aboriginal People, which for Nowanup is the local Noongar community. Many Noongar elders knew the area well before it was cleared for farming, and speak of its cultural significance. Cultural mapping on the property has underlined that significance by locating a number of cultural sites and concentrations of artefacts. After purchase in 2004 the property was made available to the Noongar community, to support their aspirations, and Noongar leader Eugene Eades resides on Nowanup. Initially employed by Greening Australia as an Indigenous Engagement Officer, and now running camps and events at Nowanup as a Noongar led program, Eugene liaises with educational, corrections and welfare institutions and agencies to coordinate a range of educational and rehabilitation programmes. Eugene has also managed, with a team of young Noongar men, construction of a ‘Meeting Place’ that has assumed considerable significance for the local Noongar community (Fig 4). Located in the heart of the Fitz-Stirling section of Gondwana Link, with its striking scenic qualities, a powerful sense of place, basic building infrastructure, cultural ‘Meeting Place’, and resident Noongar manager, Nowanup has become the focus for educational and cultural activities and programmes in the Fitz-Stirling, including an increasing level of Noongar involvement in the restoration plantings. These have included planting seedlings during community days and the expert planting of thousands of seedlings by four Noongar boys undertaking an eight week justice diversion program under Eugene Eades. Approximately 340ha of the northern portion of the property is remnant bushland, with approximately 350 hectares of cleared land to the south, which has now been largely revegetated, including with trials of local species with commercial potential. 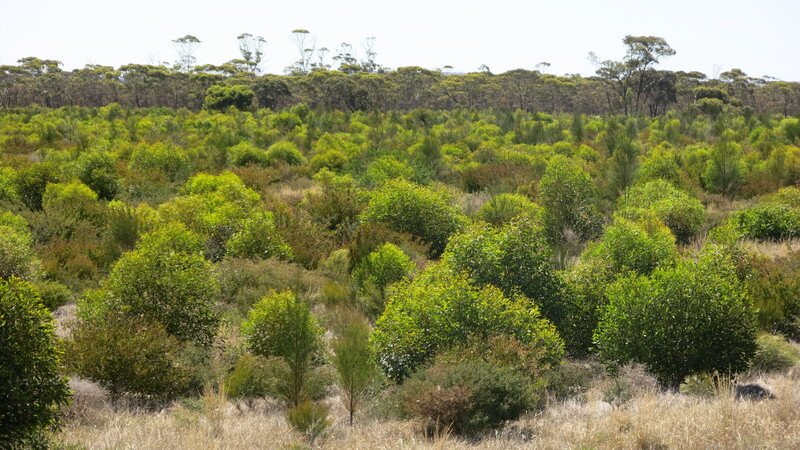 Some of the earlier plantings reflected a low-diversity revegetation approach, which was later improved across Gondwana Link plantings to better reflect the goal of ecological restoration modelled on local reference sites (see Monjebup summary). Nowanup’s early revegetation efforts were also impacted by difficulties in achieving good germination of a number of species on the sites difficult clay soils, with the result that many areas are dominated by a few species of eucalypts and acacias. These have been enriched recently by in-fill plantings which also demonstrate an improvement in the standard of work over 10 years. This has included improvements in the agronomy of direct seeding techniques (by Geoff Woodall), such as using direct drilling instead of scalping, that Greening Australia undertook in 2014, and which has subsequently been more widely used. 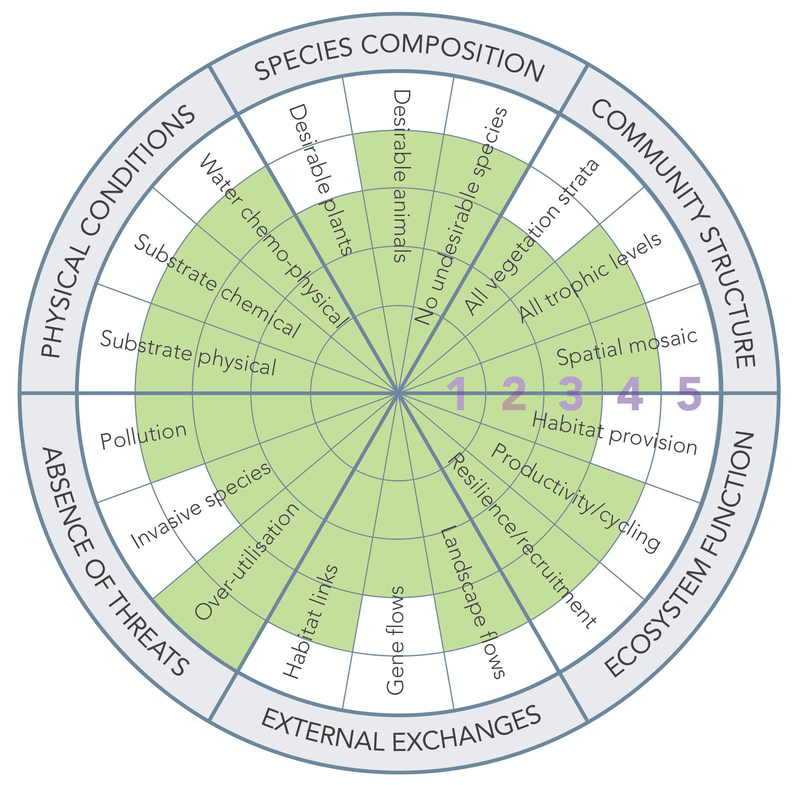 In addition, integration of cultural and ecological aspects was advanced through a 2015 direct seeding project collaboratively designed by Eugene Eades and restoration practitioner Justin Jonson, which integrates indigenous cultural meaning and values into an ecological restoration project (Fig 4). The planting is only a year old, but the integration of cultural values and the sites biophysical conditions into one inclusive design is a powerful and innovative step forward. The site has been coined ‘Karta-Wongkin-Jini’ by Mr. Eades, which means ‘place where people come together’, and , with fantastic germination to date, is on track to serve as an important demonstration of culturally informed ecological restoration in practice. Healing nature, healing people. Greening Australia was committed from the outset to engagement of the Noongar community in its operation in the Fitz-Stirling section of Gondwana Link. A cultural benefit of the project that was largely unforeseen but which developed rapidly has been the realization of the opportunities Nowanup presents for a range of programmes that support young Noongars at risk, as well as for rehabilitation and respite care. Eugene Eades has already supervised several Court arranged and respite care programmes on the property, and there is intense interest from a wide range of organisations in utilizing Eugene and Nowanup for running an extended range of programmes in the future (Fig 5). A project focused on the healing of country has great potential also for healing people. The running of such programmes is out of scope for a conservation NGO whose mission is the transformation of landscape at scale. The programmes to date have made do with the very basic infrastructure that currently exists on Nowanup, with Greening plus supporters and donors subsidizing Eugene’s role in managing the programmes. Even while operating on this ad hoc basis, the programmes have proved Nowanup’s enormous potential for expanded cultural and social endeavours in the future. Greening Australia is keen to contribute to a transition that will allow for Nowanup’s full potential for such purposes to be realized. Issues and Options. The framework plantings and larger scale direct seeding on Nowanup is now essentially complete, with the last significant works having been undertaken in 2015 – although infill plantings and seeding will occur as funding allows (Fig 6). From this point on, continuing conservation management of the property is required to ensure its contribution to ecological health in the Fitz-Stirling increases as the restoration work matures. With Greening Australia’s key focus on ecological restoration, there is no reason why properties that have been restored should not be subsequently divested to alternative ownership, so long as the necessary conservation covenants and management arrangements are in place. With Nowanup this would ideally be a body representative of local Noongar community interests. With both the original habitat areas and the revegetation and restoration areas already under protective covenant, the agreements and arrangements can be put in place to provide certainty for investment by corrections and/or welfare agencies into the infrastructure required to run properly-resourced programmes on the property. Nowanup will then be better placed to realize its full potential in healing country and people. Funding: Revegetation costs were largely met through the Reconnections program, funded by Shell Australia, the Commonwealth Government’s Biodiversity Fund and 20 Million Trees Programme. Eugene Eades funds the cultural and social programs as a private business. Gondwana Link Ltd and Greening Australia provide support as needed. Key words: revegetation, habitat construction, montane, high altitude,fauna. Introduction. Island Bend Downstream Spoil Dump, known as ‘Snowy Adit’, is one of approximately 30 former-‘Snowy Scheme’ sites in Kosciuszko National Park (KNP) that have undergone rehabilitation and restoration treatments in the last 10 years. The work is part of a program to remediate environmental risks associated with large volumes of rock dumped following underground blasting of tunnels and the cutting of benches for aqueduct pipelines constructed during the former hydro-electric scheme. At Snowy Adit, up to 950,000m3 of rock spoil was excavated and dumped. The footprint of the site is roughly 11 hectares, about 750m long and 150m wide. The site sits at an altitude of 1000m on the northern bank of the Snowy River at the junction with the Gungarlin River. The surrounding landscape is relatively intact, providing a reference ecosystem for the project, and occurs in a transitional zone between montane and sub-alpine vegetation. The dominant overstorey species is Ribbon Gum (Eucalyptus viminalis) with the sporadic occurrence of Candlebark (Eucalyptus rubida). The mid layer is dominated by wattle (Acacia species), and the shrub to ground layer includes Narrow-leaf Bitter Pea (Daviesia mimosoides), Burgan (Kunzea ericoides), Bidgee-widgee (Aceana nove-zelandiae), Carex (Carex appressa) and native grass (Poa helmsii). 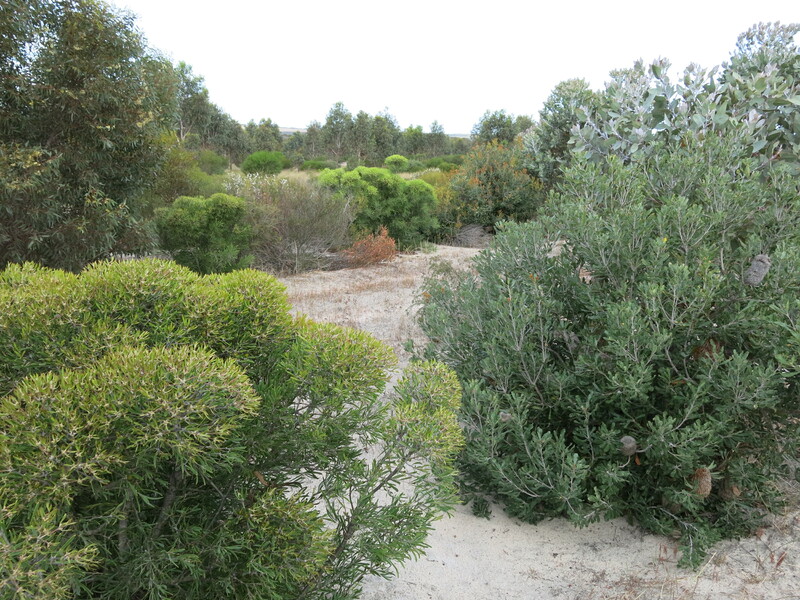 Within the rehabilitation site prior to works, the dominant species were weeds, aside from several shrubs of Burgan and the occasional Ribbon Gum. Rehabilitation at Snowy Adit aims to restore a level of ecological function and stability by reducing erosion and re-establishing native vegetation. This gives long term protection to adjoining waterways and reduces the risk of weed invasion and habitat loss to the adjoining national park (Figs 1 and 2). Spreading of woodchip in weed prone areas such as access tracks and temporary nursery location. After high initial browsing on planted seedlings by wallabies, deer and rabbits, most planting areas were progressively fenced. The steel 1.8 metre high fence had rabbit-proof netting to 1.05m high with a 300mm skirt pinned/rocked to ground, and hinge joint wire to 1.8m (Photo 4). Once in place, almost 100 percent plant establishment success was achieved. Results to date. Soils and soil function. Monitoring has shown that three years after revegetation, soil infiltration, nutrient cycling and leaf litter values are still lower than the reference site, but soil stability measures are currently higher, possibly due to the role of young plants in binding the soil. Litter levels have understandably decreased since the original application of mulch and the amount of exposed rock has increased. It is expected that the growth of the revegetation will produce increasing amounts of litter and reverse this trend. Vegetation. 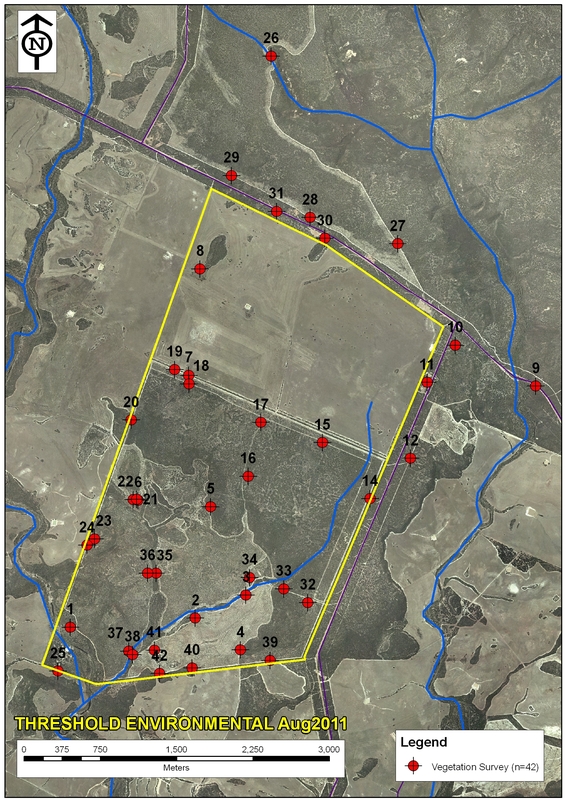 BioMetric http://www.environment.nsw.gov.au/papers/BioMetricOpManualV3-1.pdf was used to assess the condition of the vegetation along a 30m transect at 4 years after planting. This showed that the plantings had not yet developed to overstorey height but many of the Ribbon Gum had grown to midstorey height, providing a cover of 7.5%. The ground cover was mostly litter (52%) and rock (52%) with 2% bare ground. Native shrub cover of the ground layer was 20%, grasses 2% and forbs 8%. No exotic species were encountered along the transect so the total of 30% plant cover in the ground layer was all native. The number of woody stems was high (990) and similar to the control site. The level of exotic species incursion to the site was very low. Fauna. Rehabilitation works have greatly improved the habitat values of Snowy Adit, as evidence by increasing fauna recorded at the site. Pre- and post-treatment surveys have shown that, 5 years after revegetation commenced, the site is now used by at least sixty vertebrate species – 36 birds, 17 mammals, four reptiles and three frogs. Thirty-nine species were not recorded in the original 2006 survey, with 19 species (15 birds, two mammals and two frogs) attributed as a direct result of the rehabilitation works undertaken since 2006. Five threatened species were recorded in the rehabilitation area, with one additional listed species, the Powerful Owl (Ninox strenua), located in immediately adjacent forest. These threatened species were the Eastern Pygmy-possum (Cercartetus nanus), Eastern Bent-winged Bat (Miniopterus orianae oceanensis), Eastern False Pipistrelle (Falsistrellus tasmaniensi ), Gang-gang Cockatoo (Callocephalon fimbriatum ) and Flame Robin (Petroica phoenicea). The first three threatened species were not located in the original 2006 survey. The most outstanding discovery was the location of four Eastern Pygmy-possums within the fenced area of the rehabilitation area. Sixteen bird species now appeared to be either resident or regular visitors within the plantings rather than occasionally ranging into the area from adjacent forest; with nests of five species located. Several species were observed feeding flying dependent young juveniles within the planting area – such as the White-browed Scrubwren (Sericornis frontalis) and Rufous Whistler (Pachycephala rufiventris). It is considered likely that, over time, some 29 species (23 birds, four reptiles and two mammal species) which were only recorded in adjacent forest and control sites in the current or original surveys will recolonise the area as the plantings continue to grow. Lessons learned and future directions. The attention to detail in site preparation to create soil surface roughness and niches and microclimates in denuded and exposed sites at Snowy Adit is likely to explain the level of success achieved to date in terms of vegetation and habitat development. Constantly revisiting the site has also played an important role as it allowed measures to be taken to address overgrazing by both native and pest species. Taking the time to plan the works but also having flexibility to adapt and seek opportunities reaped benefits. A fortuitous supply of unwanted coarse woody debris and woodchip stockpiled at a nearby work depot also assisted with the establishment and growth of plants, controlled weeds and accelerated the return of native fauna using the for site as habitat. Stakeholders and Funding bodies. The Rehabilitation of Former Snowy Scheme Sites Program was established from Snowy Hydro Limited funding and is managed by the Landforms and Rehabilitation Team in National Parks and Wildlife Service, NSW. Nicki Taws (Greening Australia Capital Region, Project Manager) conducted the vegetation monitoring. Martin Schulz conducted the fauna surveying and reporting. Contact. Gabriel Wilks, Environmental Officer, National Parks & Wildlife Service NSW, PO Box 471 Tumut 2729, phone 062 69477070, Gabriel.wilks@environment.nsw.gov.au; Elizabeth MacPhee, Rehabilitation Officer, National Parks & Wildlife Service NSW, PO Box 471 Tumut 2729, Tel: +61 2 69477076, Email: Elizabeth.macphee@environment.nsw.gov.au. 5 Site is no longer utilized and is dedicated to conservation. 5 Site still very rocky but within range of natural variation compared to reference. Likely self-organizing. Substrate chemical 5 Similar to reference. 5 soil infiltration, nutrient cycling and leaf litter values still lower than reference, but soil stability higher. Likely self-organizing. 5 Greater than 60% of local indigenous trees, shrubs, grasses and forbs establishing. Likely self-organizing. 4.5 Very low weed status. 5 Similar to reference. Likely self-organizing. 5 High levels of litter (52%) and evidence of decomposition. Likely self-organizing. Resilience, recruitment etc 4.5 Likely seed banks building and some recruitment of shrubs and herbs. Trees old enough for resprouting. Introduction: The Stewartdale Nature Refuge is located in South Ripley, south east Queensland on private land owned by the Sporting Shooters Association of Australia (SSAA). The 969 ha block contains live shooting ranges, large open areas dominated by pasture grasses, a substantial lagoon frequented by many bird species and extensive natural areas. The area being restored is 211 ha of dry sclerophyll vegetation, containing a number of Regional Ecosystems (REs) being restored through large scale planting (reconstruction) and assisted regeneration approaches. Its conservation value is heightened by the fact that it connects to the Karawatha Flinders Corridor, the largest remaining stretch of open eucalypt forest in south-east Queensland. Condition ranges from large degraded areas (i.e. pasture) to native vegetation that contains both regrowth and remnant dry sclerophyll. All areas were impacted by varying levels of weed infestation due to previous clearing and ongoing disturbance from cattle grazing. Natural disturbances such as regular fire and periodic floods have also contributed to disturbance at the site. More than 30 weed species impact the project area at varying levels and the species and impacts vary with the condition of the land. Open areas were dominated by pasture grass such as Setaria (Setaria sphacelata) and Rhodes grass (Chloris gayana) in addition to fast growing annuals, although infestations of Leucaena (Leucaena leucocephala), Prickly Pear (Opuntia stricta) and large clumping Bamboo (Bambusa sp.) also required significant control efforts. In more forested areas (and underneath isolated remnant trees) weed species included Lantana (Lantana camara), Creeping Lantana (Lantana montevidensis), Corky Passionfruit (Passiflora suberosa), Easter Cassia (Senna pendula var. glabrata), Siratro (Macroptilium atropurpureum) and exotic grasses, annuals and groundcovers. Reduce the risk of fire moving through the site and impacting restoration works by conducting strategic slashing activities to reduce fuel loads. Planning. A restoration plan was developed after detailed site assessments and negotiations with the landholder, land manager and state government were finalised integrating Nature Refuge conditions and current land use and future management requirements. The site was divided into zones and sub-zones to assist directing works including applying a range of restoration approaches – i.e. assisted regeneration and reconstruction (‘revegetation’) and several planting models and species mosaics to different parts of the site. Detailed maps were produced for each zone and included information such as the location of all tracks, fences, assisted regeneration zones, wildlife corridors, planting areas according to each RE and numbers of species and plants to be installed per zone. The plan also included detailed information on restoration approaches; weed control at all stages of the project; seed collection and propagation; site preparation including the specifications and location of all fencing, tracks, rip lines and areas of concern (i.e. identified hazards across the site); how to carry out all works in each zone; site maintenance requirements for 5-7 years; and monitoring requirements. Fig 2. Preparation for planting at Stewartdale Nature Refuge. Fig 2. After planting to support local Koala population, Mar 2016. Works to date. Site preparation commenced with the collection of seed from on and around the wider property and surrounds ensuring that all species to be planted were collected from a minimum of 10 widely spaced parent trees. Primary weed control started with the control of weeds in the 65 ha of assisted regeneration zones and the control of other woody weeds across reconstruction areas in preparation for slashing and other activities. More than 18 km of fauna friendly fencing (i.e. no barbed wire) was installed to protect planted stock from browsing by large herds of macropods and cows. Two large corridors were retained for fauna to reach Bundamba lagoon from different parts of the regional corridor as it is an important resource for many local and migratory fauna. Slashing across open areas was commenced and followed by the installation of rip lines to alleviate soil compaction and assist efficient planting activities. Weeds and pasture grasses were then sprayed out along all rip lines. 114 000 koala food and shelter trees were planted according to the RE for each section and according to the local conditions (i.e. whether it was low lying, on a ridge or near infrastructure). Some additional frost resistant and local Acacia species were also added to particularly frost prone areas to assist the development of a canopy and the protection of developing vegetation. The 114 000 tubestock were installed over a 7 week period with the last stems being planted in April 2015. All trees were fertilised and watered at the time of planting and where possible, slashed grass spread across the rip lines to assist retaining moisture and slowing weed regrowth. (Follow-up watering was applied to all planted stock between September and October 2015) Nearly 2000 (1 m high) tree mesh guards were installed to protect planted stock in fauna corridors. Growth of saplings is improved without competition. Results to date. As of March 2016, weeds have been significantly reduced across the 65 ha of assisted regeneration areas. Unfortunately a wildfire fire went through approx. a third of the project area after primary and follow up weed control works had been completed. Fortunately the event was prior to planting though the fire did reduce the number of trees regenerating in assisted regeneration patches as many were too young to withstand the fire. New germinations are however occurring and the level of native grasses, groundcovers and other native species have increased due to ongoing weed control efforts. Despite heavy frosts in winter 2015, a flood event in May 2015 (150 mm of rain fell in 1.5 hours) and now an extended dry period, the planting is developing well with the average height of trees at over a metre tall and mortality under 5%. Weed control is continuing across the project site with efforts currently concentrating on the control of many annual weeds such as Cobbler’s Peg (Bidens pilosa), Balloon Cotton (Gomphocarpus physocarpus) and Stinking Roger (Tagetes minuta) and many exotic grasses such as Setaria (Setaria sphacelata) and Rhodes grass (Chloris gayana) to reduce competition to planted stock. Assisted regeneration areas are being joined up to planting zones wherever possible to further assist the development of the site. It should also be noted that Birds Australia have recorded 69 bird species on site. Ongoing works: Regular maintenance continues on the site with the control of weeds particularly along rip lines where weed germination and growth is rapid. Slashing is also regularly done between the rip lines and along tracks and fence lines to assist access around the site and the management of fuel loads and therefore wildfire across the site. It is expected that the time it takes to complete each maintenance rotation will begin to reduce as plants become more established and start to develop a canopy. Weed control will also continue in all assisted regeneration zones and is also expected to reduce with the development of native vegetation structure and diversity together with the reduction of the weed seed bank. Ongoing slashing, fence maintenance and monitoring will continue for another 3-5 years though the exact time period will be determined by the State government. Monitoring including soil moisture readings, transects to assist determining survival rates across the site and photographic monitoring is regular and further supports 6 monthly reporting requirements. Stakeholders and funding bodies: Department of Environment, Heritage and Protection, Queensland State Government; Sporting Shooters Association of Australia (SSAA). Photos: Ecosure. Contact Information: Jen Ford (Principal Restoration Ecologist, Ecosure TEl: +61 (0)7 3606 1038. Introduction: Numinbah Conservation Area, located in the hinterland of the Gold Coast in south-east Queensland, is one of many natural areas managed by City of Gold Coast’s Natural Areas Management Unit (NAMU). The 598 ha property contains 12 Regional Ecosystems (REs) ranging from sub-tropical and dry rainforest to dry and wet sclerophyll types; and include riparian zones, steep areas, gullies and rocky outcrops. Its conservation value is heightened by the fact that it connects to other reserves including the World Heritage areas of Springbrook. Condition ranges from large degraded areas (i.e. pasture) to native vegetation that contains both regrowth and remnant areas. All areas were impacted by weeds due to previous disturbance from logging and subsequent cattle grazing. More than 35 weed species impact the site at varying levels with the most notable species across the site being Lantana (Lantana camara). Edges are impacted by exotic vines such as Glycine (Neonotonia wightii), the understorey by many herbaceous weeds such as Mistflower (Ageratina riparia) and rainforest zones by persistent weeds such as Coral Berry (Rivina humilis) and Passion Vines (Passiflora spp.) to name a few. Approximately 60 hectares of open area are dominated by pasture grasses and other weeds. Planning. 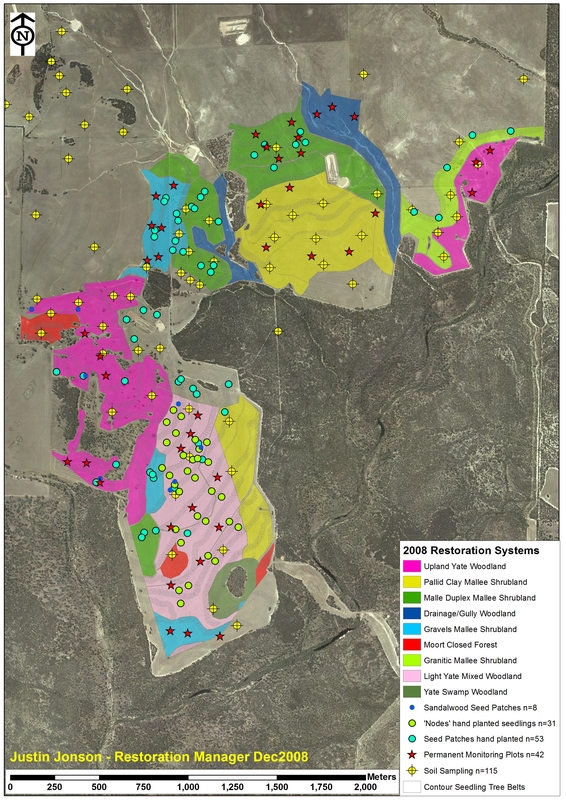 An ecological restoration plan was developed after detailed site assessments and the site was divided into precincts, zones and sub-zones to assist directing works. Information in the plan included species lists, weed control information, maps and detail on how to restore each area and progressively link zones. A detailed fire management plan was also developed for the site that took into account wildfire mitigation, restoration zones, the location of threatened species, site objectives, REs including their recommended fire regimes, and the capacity of areas to regenerate. Works to date. Works over the last 9 years have covered more than 190 ha. The main approach to restoration has been via assisted regeneration consisting mainly of large scale weed control and the fencing of areas to reduce the impact of cattle. Further works have involved planting a section of creek to assist stability and connectivity across a section of the site; and the propagation and translocation of four threatened flora species (details not disclosed for security reasons). 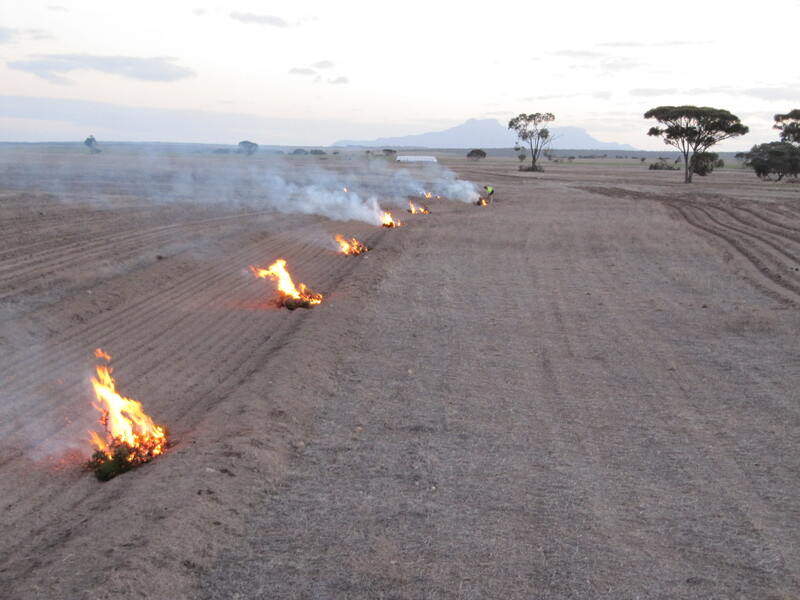 Where low intensity fuel reduction burns were conducted in dry sclerophyll vegetation, timely follow up weed control was applied to ensure re-shooting Lantana, Molasses Grass (Melinis minutiflora) and other weeds did not fill gaps and to support the colonisation and growth of native vegetation. In remnant and regrowth vegetation, systematic weed control using a range of techniques has been applied. E.g. large areas of Lantana were controlled using three techniques: cut, scrape and paint where it was in close proximity to native plants; over-spraying after isolating infestations; and, spot-spraying when it germinated or was re-shooting. Weed species were continually suppressed to ensure native species germinated and grew to a point where most gaps have been filled with native vegetation. As each area developed and maintenance reduced, efforts were put into continually expanding the work fronts. A propagation and translocation project was also implemented in partnership with Seqwater. More than 1150 individuals (four species) have been propagated, planted into their particular niche and have been monitored and reported on annually. This will continue until all species are considered to be self-sustaining i.e. flowering, fruiting and reproducing. Results to date. As of July 2015, weeds have been significantly reduced across the 190 ha treated area to a point where maintenance is being applied, with some areas requiring little to no maintenance. In a number of areas this reduction of weed has also significantly reduced fuel levels. Increased abundance and diversity of native vegetation has occurred across a range of ecosystem and habitat types within the reserve. Open areas once dominated by dense Lantana have taken approx. 3 years to naturally regenerate with a range of pioneer, early secondary and later stage rainforest species (Figs 1-3). Many of those areas now include continuing recovery of later stage species and contain a large diversity of seedlings, groundcovers and ferns. More diverse communities have recovered with a large range of species (depending on the ecosystem / ecotone) and support a diversity of fauna species. Works in four of the larger precincts have now joined up and weed control works are continuing to expand all regenerating areas. More than 7000 plants installed along the open riparian stretch are establishing with native species regenerating amongst the planting. After approx. 7 years the average height of the planted canopy is approx. 5-7m tall. Ongoing works: All current work zones are being continuously extended ensuring progress made is maintained. The open area (e.g. paddock) is being reduced over time as vegetation is encouraged to expand (i.e. by continuing to control weeds to past the drip lines of all native vegetation). Fences that currently contain cattle (i.e. to assist managing open areas for access, fire management and to ensure funds are spent in more resilient areas) are being moved to continue to reduce the size of highly degraded areas. Fire management, large scale weed control and the monitoring and evaluation of threatened species, together with fauna surveys, is continuing.